LBB is back! The biggest and best ever at a brilliant new venue - Ministry of Sound in Elephant and Castle. This Sunday spectacular is the same weekend as London Fetish Weekend, and will host 40+ brilliant, handpicked alternative fashion designer/makers including accessories, jewellery, leather, latex and all things shiny and dark. Pick up something unique for your Halloween outfit, then relax with ample seating, a cocktail bar, food and DJs all day. Open 1pm - 7pm. Entry is £5 if you click ‘Going’ on the FB event page in advance or £10 on the door (cash only). Crafty Fox is London’s premier designer/maker market, featuring only handmade goods with a carefully selected, varied line up each month. I’ll be selling at the Sat 6th Oct event at Mercato Metropolitano in Elephant and Castle, a 3-warehouse venue packed with streetfood stalls and 30+ accessories, jewellery and homewares sellers. Line up here. It’s free entry and open 11am - 5pm. See you there! We are back! Le Boutique Bazaar returns to Old Spitalfields Market for another summer one-off event, with delightful and dark gothic clothing, festival gear, homewares, artwork, accessories, zines and more. Event page is here - free entry! I will have a range of hats and headdresses for sale, including shiny glossy vinyl versions of vintage designs. Sunday 5th August 11am - 5pm, London E1 6AA. I'll be selling hats all afternoon and evening at the Rockabilly Rev Up on Saturday 4th August, hosted by Cinq Ports Swing Jive Come along for a great outdoor summer social. 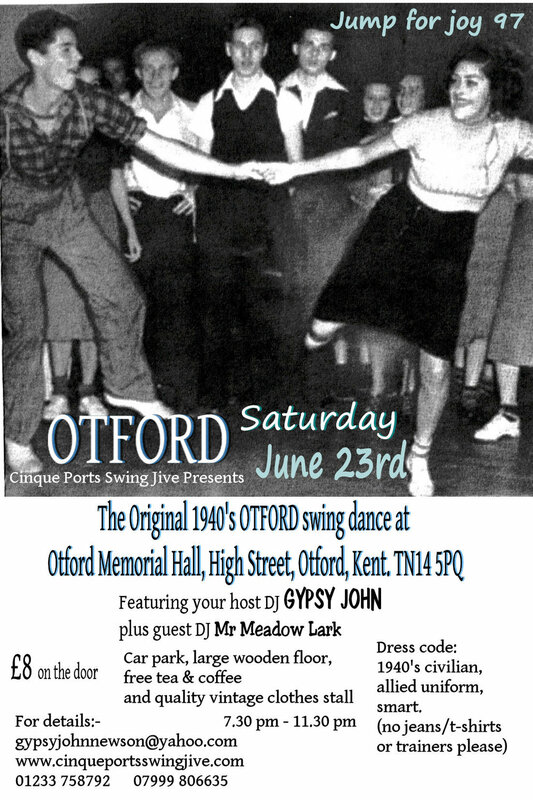 I will have a hat stall of 1930s, 40s and 50s styles plus straw and felt fedoras and other hats at the Otford Swing Dance on 23rd June. More stalls and lots of entertainment too. I'm exceptionally pleased to be hosted by Who's Wearing What boutique in St Leonards at one of their monthly local makers events. I will have a broad range of hats, headdresses and hair accessories perfect for events in Hastings/St Leonards.... starting with the Jack in the Green! Event times: 12 noon - 3pm, and I will be selling with at least 10% off my Etsy prices. 8th April - Le Boutique Bazaar - NEW VENUE! I'm very excited to be back at Le Boutique Bazaar on Sunday 8th April just before the Torture Garden Birthday Ball weekend! The new venue is the fabulous Proud Embankment by Waterloo Bridge - a great new cabaret venue hosting an LBB event that's bigger and better than ever before. There will be 40+ vendors of unconventional fashion, costume, accessories, millinery, latex, jewellery and lingerie. You'll also find comfy seating, a cocktail bar, DJs and a brilliant, social atmosphere for browsing. Click 'going' on the Facebook event page for cheaper entry. I'll be at the Blink pop up arts market on Saturday 16th Dec 12-5pm, Earl Haig Hall (Elder Avenue, Crouch End, North London). There will be 22 unique stalls: cards, Christmas decs, jewellery, accessories, homewares and of course hats! Free entry and a bar, mulled wine, mince pies and a festive fairy grotto feel. Pop in Crouch Enders!